These Deluxe feature upgrades are normally $275, but FREE with April orders. The standard Rail tubes have an open end with a single-side pivot bracket and no nylon bushing. 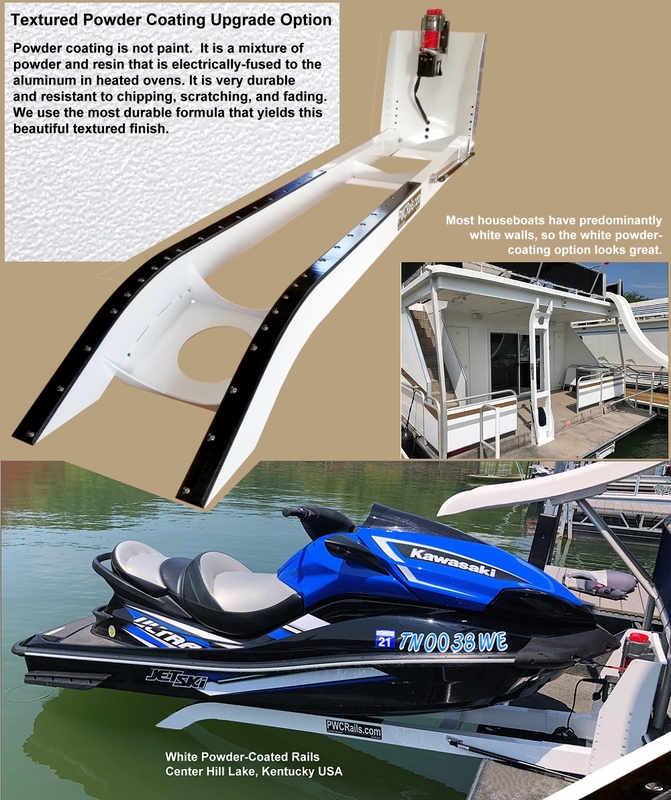 The rectangular tubing has a square edge while the deluxe rails have a rounded top edge which provides a broader surface against which your PWC will slide. White powder coating is optional but available in April for half price. Click here to see a complete powder-coated Rail. Q: How do I know if my houseboat will support a PWC Rail? A: Generally, even relatively small welded aluminum houseboats will handle the weight. By "small" we mean about 50 feet long and 14 feet wide. 2) The floatation level of your boat. Obviously, the smaller your boat, the more that much weight will affect is floatation angle in the water. That might not matter to you, depending on your goals. If you only want a way to store your PWC while not using your boat, then the angle in the water won't matter because you will unload your PWC before using your boat. Click here to read more about how to know if your swim platform can handle the weight. If you have a yacht, cruiser, or any boat that is shorter than 50 feet, our Cross-Deck Models might be the best solution for you. Q: Which side of my houseboat should I install my Rails on? A: Since our Rails are mounted completely on the swim platform, you don’t need to consider stairs or a/c units. 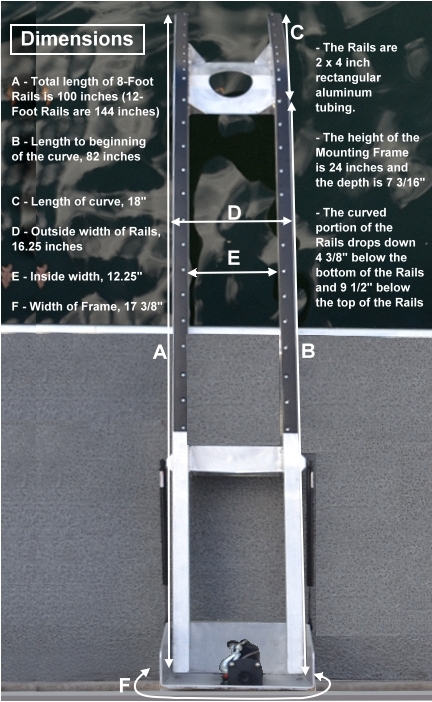 If your houseboat has a little list to one side or the other, then you would want to put your Rails on the higher side. If you refuel your PWC with a pump from your houseboat tanks, then you would probably want the gas cap of your PWC toward the inside to make it easier to reach. 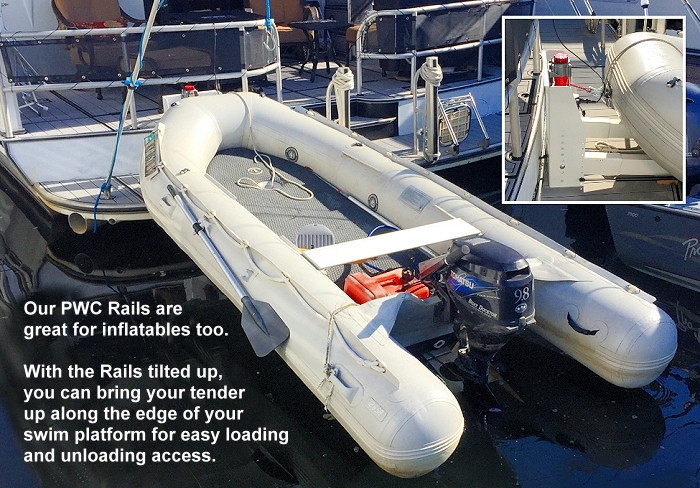 If you are installing 2 Rails...one on each side, then you generally want to mount them as far to the outside as possible so that when loaded, the PWC's aren't any wider than your houseboat. A little narrower is even safer when maneuvering around a cove or gas dock. Q: Can I mount these Rails over the top of my swim ladder or next to my slide? A: Yes. That is one of the big advantages of the Tilt-Up Rails. If the only place on your swim deck that is available is over your slide, you can mount it right there. With your PWC unloaded and your Rails tilted up, you can use your ladder just like always. You can also mount it next to your slide. 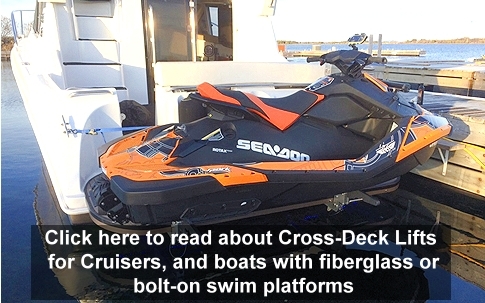 Modern 3-seaters are over 4 feet wide but the Rail tubes are only 16.5 inches wide, so you can mount the Rails in such a way that your PWC us partly under your slide. When you are ready to use the slide, just unload your PWC, tilt the Rails up, and start sliding. Click here to see an installation like that. Q: If I get 2 Rails, can I use just one winch and save some money? A: The winches are a relatively small portion of the cost, and they bolt to the frame. So it would be a significant hassle to swap the winch back and forth. Also, that would require that you have additional 12-volt wiring lying on the deck so it would reach the other side. It just isn't practical for such a small amount of savings, so we don't recommend it. Q: How long are the Rails? A: The flat portion of the standard Rails are 82 inches long and the angled entry-end is 18 inches long for a total of 100 inches. Most modern 3-seater PWC's are about 11 or 12 feet long, so a substantial portion of your PWC will extend beyond the Rails. 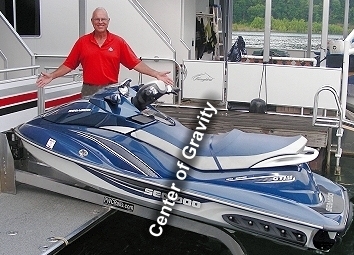 When loaded, the center of gravity (CG) of your PWC will be securely on the rear of the Rails. The hulls of PWC's are structurally self-supporting, so there is no need for the Rails to extend all the way to their stern. We also offer extra long 12-Foot Rails for high deck mounting installations such as houseboats and pontoon boats without swim platforms, and decks and pier installations. Click here to read more about these long Rails. Q: Why can’t I use the 8-Foot Rails on a pier or other high-deck installation? A: With a higher mounting surface above the water, the angle of the 8-Foot Rails has to be steeper in order to reach close enough to the water to engage the hull of the PWC. That is fine if the PWC is only 8 feet long. But most 3-Seaters are now approaching 12 feet long, so the rear of the PWC would be in the water where the thruster and steering linkage would quickly become contaminated. Our 12-Foot Rails can be mounted at a more gradual angle, and PWC’s are fully contained on the Rails which are above the water…so no contamination. This picture shows more dimensions of our Standard 8-Foot Rails. The 12-Foot Rails are the same, except for the overall length is 144 inches. Q: Is the width of the Rails adjustable? A: No, the width is fixed. The inside width of the rails is 13", and the outside width is 17". This will accommodate all PWC's. It is possible that the chines along the hull with some models might cause the PWC to rest at a slight angle if one chine is up on one rail and the chine on the opposite side of the PWC is down just inside the rail. But this would be rare, and would not cause any problem at all. Q: PWC Hulls are V-shaped and the Rails are rectangular? Is that a problem? Shouldn't they be slanted inward to match the hull? A: Hull shapes of different models vary significantly. But they all have in common a significant initial "V" that will push hard against the inside of the UHMW-covered rails, and a gradual flattening toward the stern that will rest on more of the surface of the UHMW. Our Rail tubes are custom fabricated with the top-inside corner rounded similar to the shape of a pipe. The UHMW forms over that rounded portion as your PWC presses down on it which creates a "soft edge" against your hull. We use 2x4 inch rectangular tubing because of its incredible strength and ability to handle the leveraged weight and down-force. Q: How easy is it to tilt my Rails up and down? A: Because of the angle of the gas-shock lift-arm to the Rails, it allows the weight of the Rails to rest firmly on your swim platform when unloaded (the "push" is mostly parallel to the Rails). With just a little bit of one-handed lifting effort, it tilts the Rails up to the upright position where the lift arm will safely hold them in an upright position when you are using your swim platform. The Heavy Duty Rails require more lift, but still an easy task for one-person. You can order a second lift arm if you are getting Heavy Duty Rails (see the order form). In the upright position, the "push" of the lift-arm is at an angle to the Rails, so they are held securely in place. To lower them, you just push them down. As they move away from the upright position, they will reach the point at which the lift arm gas shocks will not have enough leverage to hold them up, so you support them as you lower to the loading position resting on the aft-end of your swim platform. The lift-arm effect is similar to the back door of a min-van or SUV. Q: When my Rails are Tilted-Up, will they reach my upper deck? A: Most upper decks extend to the end of the rear deck, but not over the swim platform, so even our 12-Foot Rails won't touch the upper deck. Additionally, since the Rails are mounted down a step or two, that gives additional clearance. The 8-Foot Rails are 87 inches long to the beginning of the loading angle, and 103 inches overall including the pivot connection. With this configuration, they will not touch the upper deck of most houseboats. But even your upper deck extends out over the swim platform and that stops the Rails from going to a full upright position, that is OK since the lift arm will hold them as high as they can go. They will still be out of the way and give you a fully-open swim platform. Q: Do I need to use a Safety Tether? 1) As pictured here, when tilted up, wrap the winch line around the cross member to prevent unintended lowering the Rails. 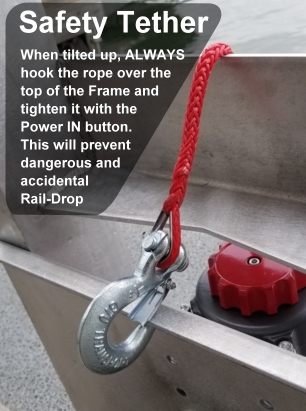 2) When your PWC is loaded and winched up, we recommend that you add a secondary tether that connects your PWC to something other than the winch drum. Then, relax the tension on the winch so that the majority of tension is on the tether. Click here to see the easiest way to do that. 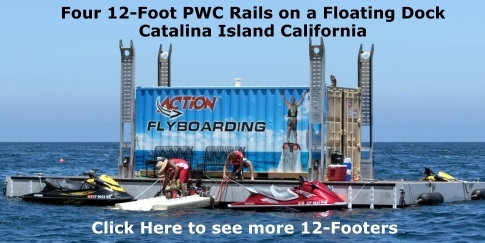 Q: After I place an order, how fast can I get my PWC Rails? A: We try to keep an inventory so we can ship immediately. But this depends on the current flow of orders. Please ask about the timing based on the current orders. A: We ship upon receipt of the payment. If we don't have inventory to ship immediately, you can place the order without payment (unless custom work is needed) and we will let you know when to send the payment. We prefer checks, but will accept Visa, Mastercard or Discover with a 3% additional service fee..
Q: What is the shipping cost and method? A: The complete Rail Kits are shipped from Dayton Ohio, 45342. You can arrange to pick them up here if you wish. 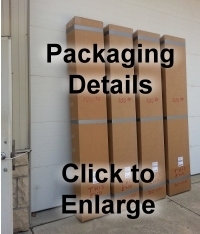 The packaging of our standard 8-Foot Rails is 103x18x10 inches and 100 pounds and shipswithin the United States for about $200 to $250 depending on the region. If ordered in April we will charge a flat $150 and cover the difference. . If you are ordering the 12-Foot Rails, please ask about shipping. A: We don't provideinstallers. Most of our Rails are customer-installed. But if you are not comfortable with self-installation, perhaps a pier-mate will help you. Most young marina employees are comfortable with a drill and 12-volt wiring and will do it after hours for $100 or so with you helping them. Most people consider it a very simple process. You can read full installation instructions here. 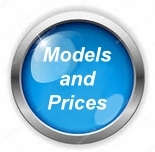 We are offering over $1,000 in total discounts for orders placed in April ! If you have any other questions about our PWC Rails, please don’t hesitate to ask. You can call me directly at 1-937-985-5863 (Eastern USA), or send us an email.